The amygdala is a collection of nuclei found deep within the temporal lobe. There are two amygdalae, one in each hemisphere. 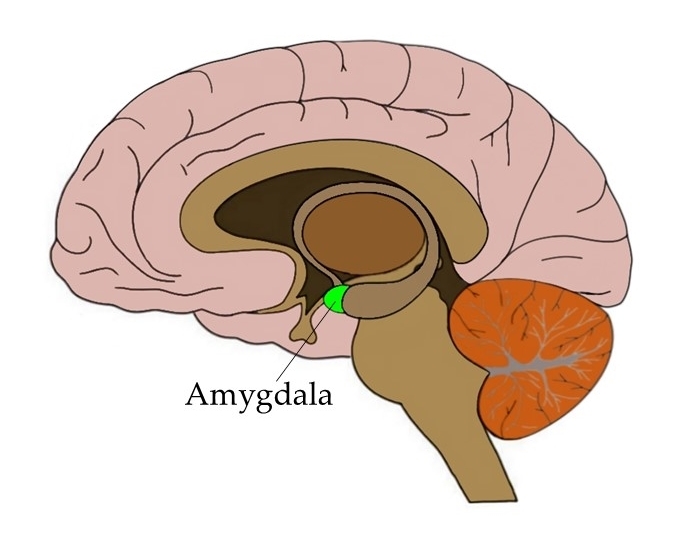 The term amygdala comes from Latin for "almond" because one of the most prominent nuclei of the amygdala has an almond-like shape. The amygdala is recognized as an important component of the limbic system, and as such it is thought to have roles in emotion and behavior. In an experiment conducted in the 1930s, Heinrich Kluver and Paul Bucy removed the amygdalae of rhesus monkeys and saw drastic effects on behavior. Among other things, the monkeys became more docile and seemed to display little fear. The constellation of behavior that resulted from amygdalae removal was called Kluver-Bucy syndrome, and it led to the amygdala being investigated for its role in fear and anxiety. Since, the amygdala has become best known for its role in fear processing. When we are exposed to a fearful stimulus, information about that stimulus is immediately sent to the amygdala, which can then send signals to areas of the brain like the hypothalamus to trigger a "fight-or-flight" response (e.g. increased heart rate and respiration to prepare for action). Interestingly, information about fearful stimuli can reach the amygdala before we are even consciously aware of it. There is a pathway that runs from the thalamus to the amygdala, and sensory information about fearful stimuli is sent along this pathway to the amygdala before it is processed by the cortex. This allows for the initiation of a fear reaction before we have time to think about it, which can be useful if we really are in great danger. For example, if you are walking through the grass and a snake darts out at you, you don't want to have to spend a lot of time cognitively assessing the danger the snake might pose to you. Instead, you want your body to experience immediate fear and jump backward without having to consciously initiate this action. The direct pathway from the thalamus to the amygdala allows this to happen. In addition to its involvement in the initiation of a fear response, the amygdala also seems to be very important in forming memories that are associated with fearful, or otherwise strongly emotional, events. For example, if you take mice with intact amygdalae and play a tone right before you give them an uncomfortable foot shock, they will very quickly begin to associate the tone with the unpleasant shock. Thus, they will display a fear reaction (e.g. freezing in place) as soon as the tone is played, but before the shock is initiated. If you attempt this experiment in mice with lesions to the amygdalae, they display an impaired ability to "remember" that the tone preceded the foot shock. You can play the tone and they will continue about their business as if they have no bad memories associated with the tone. It shouldn't be too surprising, given its role in fear processing, that the amygdala is also thought to play a role in anxiety. While fear is considered a response to a threat that is present, anxiety involves the dread that accompanies thinking about a potential threat--one that may or may not ever materialize. A number of studies suggest that the amygdala is involved in experiencing anxiety, and that it may be overactive in people with anxiety disorders. However, as is the case with most human behaviors, anxiety likely involves a network of brain areas, including for example the hippocampus and prefrontal cortex. Although the amygdala is well-known for its role in fear responses, more recent research has found that it is active not only when one is experiencing something aversive, but also during positive experiences. This has led researchers to expand the role of the amygdala to include assigning positive value to stimuli in the environment as well as aiding in the consolidation of memories that have some strong emotional component---whether that component be positive or negative. Thus, our understanding of the function of the amygdala is still evolving, and we likely have much more to learn before we can fully catalog the activities of this complex structure.